The section Engine Settings → Settings → Mailling allows an administrator to control all contents of an email sent to users. 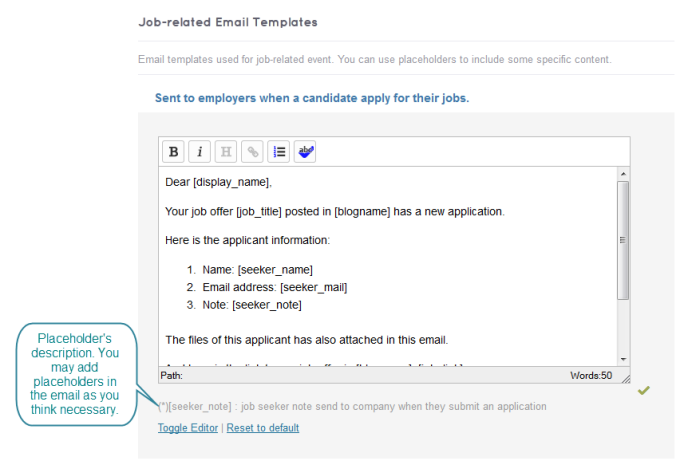 JobEngine provides eight templates and placeholders for authentication and job-related emails. 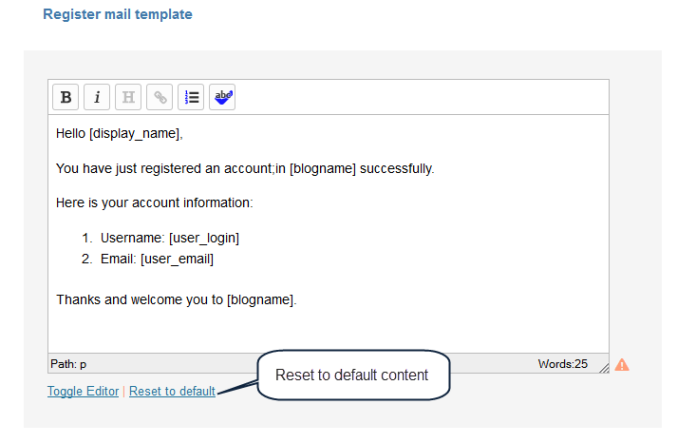 Should you need to add other information in the e-mail, you can edit the templates anytime. However, please note that placeholders cannot be modified. To save your edits in any template, just click anywhere outside the box. Register email is sent to users to notify them that they have successfully registered in your site. The email contains their account information. This email is sent to users requesting to retrieve password. Users receive this email once they activated the active link in forgot password email. It notifies them that they have successfully changed their password. This notifies employers of new applications in their posted jobs. It contains the applicants’ information. This serves as an email reminder for job seekers who have saved a job posted in your site for later viewing. It includes job information for easy reference. This email is used only when the site administrator enabled Pending Jobs to manually review and approve new jobs posted by employers. Employers will receive this email once their jobs became active on the site. Whenever a job post expired or a manual action is applied, it will be moved to archive. The employers will then receive this email as notification and reminder should they want to renew their job offer. 5. Sent to employers to notify that one of their posted jobs has been rejected. This email is used only when the site administrator enabled Pending Jobs to manually review and approve new jobs posted by employers. If a job is rejected, the employer will be notified through this email.